Wordiness is a classic tell for deception. Instinct says that if you have all the information, no one will question your story. Sadly, instinct is wrong. Too much information triggers skepticism in your audience even if they don’t overtly detect the lie itself. Before the study began, the researchers pulled half the participants aside and instructed them to lie about two of the five topics they would discuss. They gave the liars five minutes to prepare, and the study went forward. None of the lies were detected. However, when the researchers went back and analyzed the conversations, they discovered that the liars used approximately 30% more words when they lied than when they told the truth. That’s right. Fabrication bloated their word count by a healthy 30%. Those being lied to used more words in response to the lies. Of greater significance, they also asked more questions. Somewhere in their brain, whether conscious or subconscious, their skepticism triggered and reacted. As fiction writers, we already have one strike against us. Somewhere behind that suspension of disbelief, our audience knows we’re making stuff up. When we glut them with too many details, we stoke that instinct to overthink, to question. We’ve all been there, stuck reading a book where the narrator rattles on for pages and pages about ultimately skim-able schlock. The MC’s entire life history. Every piece of furniture crammed into a room, including its age, style, material, and exact spacial placement. Memories and mental processing ad nauseam. If it plays into the plot, it’s either tangential, or grossly inefficient. This degree of detail reveals an author too afraid to trust their reader. They exercise tight control over every angle of their story, lest the reader form an inaccurate picture of events. But books, despite their fixed sequence of words on the page, are not static. Every reader recreates them anew, informed in that creation by individual experience and understanding. No two readers will ever produce the same mental imagery for a book. One of the most powerful tools an author can access is their reader’s imagination, but imagination intrinsically thrives on the unknown. The engaged reader will pick up on subtle cues and run with them. They’ll fill in minor gaps for scenery and settings in their anticipation for what is yet to come. You might have in mind the exact 19th century antique mahogany Chippendale dresser that graces your main character’s boudoir. But do you really want your reader’s brainpower focused on trying to conjure its likeness? Unless it plays a central role in your plot, the answer is no. Details should be evocative, not completely inaccessible, and not so profuse that they overwhelm. Clot your story with too much information, and your reader’s imagination may well fail to spark. Worldbuilding can be an author’s best friend and their worst enemy at the same time. The greatest problem with these exercises, from the simple to the mind-bogglingly complex, is the danger that they might trick us into including all those details in our book. We did the work. We created monetary systems and team sports and land formations and political dynasties, and we can’t let it all go to waste. The reader needs to know we did our work. Except that the reader doesn’t need to know. They need a final draft polished and focused upon its themes, not a glut of extra information that muddles more than it enhances. Worldbuilding is awesome and empowering, but its primary purpose is to acquaint the writer with the inner and outer workings of their own creation. When we shoehorn every last category or detail into our draft, we’re just as likely to inspire annoyance as awe. Emotions play a driving force in our actions and reactions. They’re also patently difficult to counterfeit. Genuine emotions linger. Fake emotions fizzle. The liar can only pretend their strong feelings for so long. Consider a wrongful accusation. An innocent person gets angry on instinct. They go on the offensive, presenting facts that prove their innocence with a fury that remains steady throughout. And they can hold a grudge afterwards, sometimes for years, sometimes even when they’ve made overtures toward forgiveness. Wrongful accusations get us worked up, and they stick with us. And once they feel they’ve proved themselves and/or shamed their accuser into silence, they return to magnanimous calm. This pattern of false vs. true emotions follows through with other high-stakes life events. Genuine trauma, either mental or physical, often triggers depression, with rippling effects that require significant time and counseling for recovery. When someone fakes a trauma, they play to their audience for the moment but quickly forget or conveniently recover in the aftermath. 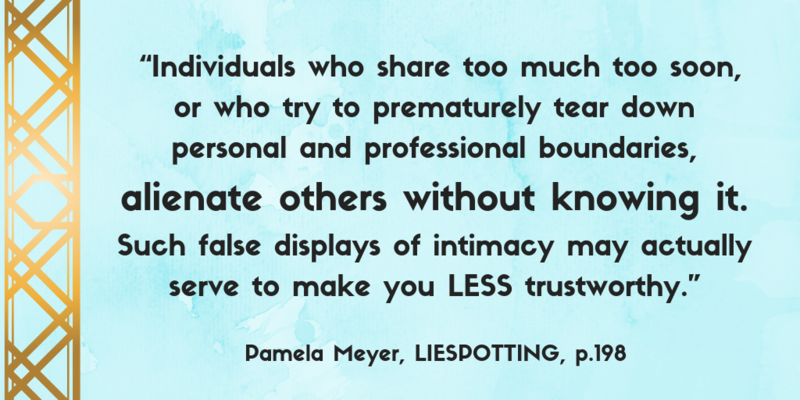 In her TED Talk, “How to Spot a Liar,” Pamela Meyer shows two clips comparing a false narrative to a truthful one. (Note/Warning: Video on that link starts at 14:46. Content includes vivid description of violence. The clips pertaining to this post finish at 16:39, but the whole talk is worth a listen.) The stark difference between the liar and the truth-teller underscores how deeply our emotions influence us, even years after an event occurs. As it turns out, our emotions also govern how we tell stories: their structure, their focus, their completion. True stories come in three parts: a prologue, main event, and epilogue. The prologue is light on detail. It can have its reference point in the beginning, middle, or end of the events. The main event is the longest part of the story. It is the focal point that every other detail revolves around, but it won’t be strictly chronological. Its driving force is emotion, not time or sequence. The epilogue constitutes the emotional aftermath. It’s where the storyteller processes everything that occurred. False stories have a prologue and main event but typically skip the epilogue. The prologue is heavy on detail, scene setting, and backstory. It may take up the bulk of the narrative. The main event gets glossed over, failing to receive the detail it would command if it were authentic. It is chronological and orderly. The epilogue often goes missing in false stories because the liar has no emotions to process. When the main event finishes, there the story ends. Think of the most emotionally charged events of your life. 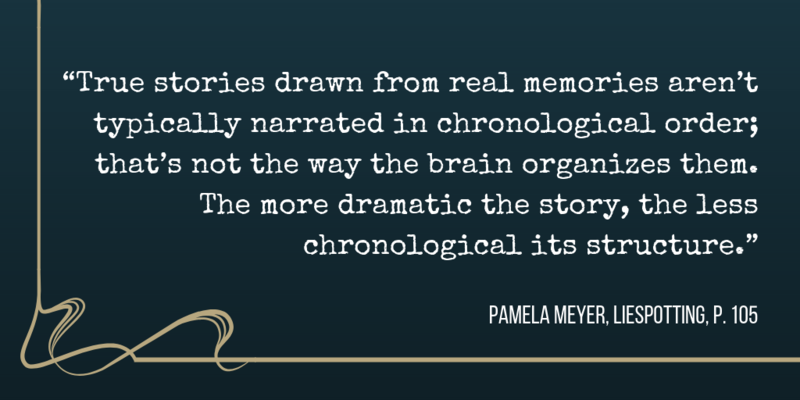 When you tell those stories, you don’t dwell on the scenery or the minutiae that happened around them. Someone who gets robbed at gunpoint doesn’t start their story with how they woke up that morning. If you get a flat tire on the freeway, chances are you tell your friends, “I got a flat tire this afternoon.” Or, more emotionally, “I almost died today.” The newlywed who recounts their wedding probably doesn’t start with the long moment of introspection they had while staring into a mirror. Our emotions help us interpret the happenings around us. The stronger the emotion, the more it influences us. In Writing, inauthentic emotions show up when characters experience traumatic events but then everyone resets in the next scene so the plot can move forward. Wounds have no lasting consequences. Betrayals are forgiven and/or forgotten. Character deaths are briefly mourned and then brushed aside. Trauma should echo into subsequent scenes, in one form or another. This is not to say that characters should wallow in depressive misery when anything bad happens, but neither should they skim through events with shallow emotional investment. Even those who steel themselves to feel nothing in a traumatic aftermath will have a breaking point. The Prologue/Main Event/Epilogue structure of truthful storytelling gives us a standard template to work with. Perhaps most importantly, the non-chronological nature of true stories reinforces why exposition and backstory are better left for later in the book. Likely, these elements are not the most emotional events in your characters’ lives. As for the story structure itself, “Prologue” and “Epilogue” don’t mean you need these formal, demarcated sections. A prologue, in this instance, would be the introductory material that flows into the main event. Each of these serves as a preamble, even though they fall in Chapter 1 of their respective works. They also represent examples of beginning-, middle-, and end-focused prologues. Cold Comfort Farm starts at the beginning, with Flora’s life prior to the events of her story. We learn from that simple opening line that she does not value her education (or her parents, as we soon discover), that she despises team sports, and that she has a penchant for efficiency. Flora has yet to contact the morbid relatives who will house her for the bulk of her tale. Instead, this introductory chapter highlights many of the absurd tropes that Gibbons’s delightful little satire is about to skewer. (Including the Mysterious Traumatic Backstory, haha). One might, from reading the opening line of The Moon-Spinners, assume it also starts at the beginning. It has the word “started” in it, after all. However, our narrator, Nicola Ferris, has already arrived in Agios Georgios for her holiday. She backtracks to give the events that led her there, but that egret from the first line leads her up the mountain, where she stumbles upon a plot already deep in play. Stewart could have easily begun with Nicola in Athens, in her vacation-planning phase. But, as Nicola so aptly says, the true adventure starts with the egret, so there begins the story too. Daphne du Maurier’s iconic opening line introduces a narrator already far removed from the story she is about to relate. The rest of the chapter firmly establishes this, with Mr. and Mrs. de Winter living from hotel to hotel, forever trying to escape their traumatic past, and forever haunted by it. Had Rebecca started at any other point than this, the whole dynamic of the novel would change. By beginning at the end, du Maurier creates an atmosphere of fatalistic dread for what is yet to come, despite many light-hearted moments throughout the book. Each of these “prologues” reflects a driving emotion of the book: Flora’s cheerful efficiency, Nicola’s guileless curiosity, and Mrs. de Winter’s heartbreaking anxiety. These emotions carry through the main events. They influence not only how these characters react to their situations, but also how each author unfolds her story. Epilogues serve a similar purpose, summarizing a novel’s emotional themes. Authors who choose abrupt or open endings leave their readers to process through those emotions alone. Which, mind you, is a legitimate stylistic choice. 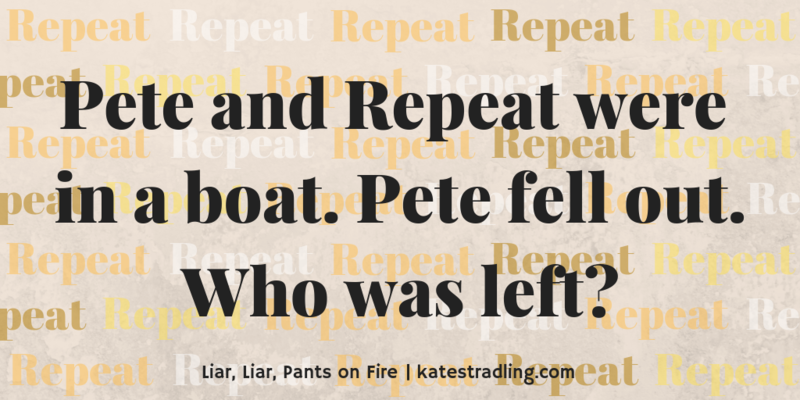 Next up in our patterns of deception: repetition. Partial repetition indicates a desire to clarify. Repetition in full is a subconscious mechanism that occurs to delay answering, giving a split-second more for Person B to formulate a less-than-truthful response. And there could be a totally legitimate reason for Person B to deflect. Person A could be a creep. They could simply have no right to know Person B’s schedule. Regardless, this deceptive tactic shows Person B’s reluctance to tell the truth. Seasoned liars also take advantage of the Illusory Truth Effect. Research shows that the more often we hear something, the more likely we are to accept it as true, even if it has no basis in fact. This phenomenon falls in line with the infamous “repeat a lie often enough and it becomes the truth” quote often attributed to propagandist Joseph Goebbels. The Illusory Truth Effect feeds gossip threads and conspiracy theories alike. It drives smear campaigns and old wives’ tales. Fake News™ on both sides of the political aisle relies on the Illusory Truth Effect to oil its gears. Lie, lie, repeat, repeat, repeat. Sooner rather than later people believe a story not because it’s true, but because they’ve heard it so many times that they accept it must be true. True Believers, when presented with evidence to the contrary, often retreat into the Fake but Accurate defense. Ultimately, we each believe what we want to believe. Everything is tiny. Or blue. Everyone is standing or walking or turning. Or going back, turning back, backing up, looking back. Repetition of this type manifests when an author feels the need to describe every minute action that their characters take, every slight angling of the body, every tilt of the head, every twinkle of the eye. And yes, I’m drumming in the fault with an overuse of “every.” Repetitive diction used on purpose drives home a point. By accident, it chafes like a bur stuck in your reader’s sock. Wanna know a secret? Proper nouns aren’t nouns. They fall into a grammatical class called “Determiners,” the same grammatical class that pronouns and articles belong to. Proper nouns only have meaning according to their surrounding context, and they can only be swapped for another Determiner or Determiner Phrase. So, for example, “Mary” can equal “she” (D) or “the woman” (DP), but not simply “woman” (N). However, they are marked determiners, and any marked part of speech draws attention to itself if used more than necessary. The unmarked form, personal pronouns, blend in with the surrounding narrative unless their context (their referent) is missing. In which case they become marked. John entered through a side door, laughing. He rubbed his hands together. “You’ll never guess what I just saw,” John said. That last “John” is clunky, right? When we already know who a narrative refers to, the unmarked personal pronoun becomes the preferred determiner. The temptation to paraphrase or recap events often comes as part of the drafting process. Sometimes weeks, months, or even years can pass between when you write one scene and its follow-up, and you instinctively want to make sure that the reader remembers that earlier event so they’re not lost. However, in a total immersion reading situation, a reader can consume the whole book in 5-7 hours. It may have been as little as 10-15 minutes since they encountered that information. In general, they don’t need you to revisit it, and certainly not in great detail. Mary knew she was a selfish creature—she had been for years. If there was anything life had taught her thus far, it was that she could only rely on herself, that no one else really cared whether she lived or died. That was an exaggeration, of course—her grandfather tried, but his hands were tied from so many directions, including his own ingrained beliefs. He had changed, she knew, and probably still was changing, but she only trusted him to a point nonetheless. She had been left to her own devices too many times and had come to realize that everything was much simpler if she assumed she would receive help from no external sources. So long as she kept that cynical outlook, she owed nothing to anyone else; as an added benefit, she was not tethered down by any sense of loyalty or obligation to help others. There’s a lot that’s wrong with this excerpt, but I’ve highlighted instances of repetition, both exact and rhetorical. First, we have a repetition of narrative frame: “Mary knew” and then halfway through the paragraph, “she knew,” again. Y’know. Just in case you forgot we were still inside Mary’s head. Paraphrase (A) tells us she’s selfish. Three times over. Paraphrase (B) tells us that her life’s experiences molded her into this selfishness. Twice. Paraphrase (C) tells us how she interacts with the world because of her selfishness. Or rather, that she doesn’t interact with anyone. Mary had been a selfish creature for years, left to her own devices too often to rely on others and resentful when others tried to rely on her. This cynical outlook freed her from any sense of loyalty or obligation toward the rest of the world. The revision condenses the many evidences of Mary’s selfishness into two sentences, ditches the narrative frame, and omits the details about her grandfather. We state simply what Mary is, why she is that way, and how it shapes her worldview. The reader doesn’t care about the details of Mary’s selfishness, except in how that selfishness will drive her actions through the plot. Does this repetition serve a purpose? Does it fulfill that purpose? Is it necessary right here? If you answer “yes” to all four, forge ahead. If not, revise. Indirect discourse is a dead giveaway that someone doesn’t want to speak the whole and ugly truth. 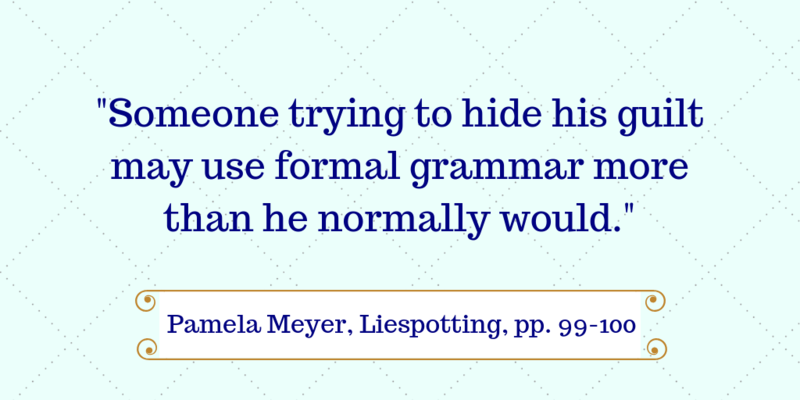 This common and oft-maligned structure acts as a hallmark of indirect speech. In passive voice, the lexical object of a transitive verb elevates into the subject position, and the subject removes either to a prepositional phrase headed with “by,” or to oblivion. In layman’s terms, passive voice takes the focus off who did something and places it firmly on what occurred. Liars cleave to this construct because it allows them to talk around their own culpability. It doesn’t matter who stole it, just that it was stolen, right? …Right? Liars use fewer 1st person pronouns, and more 2nd and 3rd. This form of prevarication shares its source with use of passive voice. A liar doesn’t want you to focus on them and what they’re doing. They’d rather point your attention elsewhere, to what you and everyone else did. A distanced narrative sounds more objective because it assumes a neutral point of view. It’s why scholarly papers largely avoided 1st person pronouns up until the last decade or so: researchers sought for that clinical tone that gave their work more gravitas. But in recent years, usage has shifted, to where “I” and “we” are not only accepted but encouraged in academic literature. There’s greater credibility in owning your research instead of attributing procedures and results to some unnamed arbiter. Avoidance is a standard tactic to steer around the truth. Don’t like the topic? Pick a new one and hope your conversational partner doesn’t notice. Except that most of us do notice. This tell, except when performed by the wiliest of prevaricators, sticks out like a tulip in a marigold patch. The liar who changes subjects relies on the politeness of their listener not to change it back. Passive voice is not every occurrence of the verb “to be” in your manuscript. Our wondrous and irregular “be” has five distinct functions in the English language, and its role as the passive auxiliary is only one of these. Passive voice is also not the use of filter verbs (to be discussed in a later post). It is a specific grammatical construct formed with auxiliary be + a passive participle. Passive voice can only occur with transitive verbs. It is impossible for intransitive verbs to form the passive voice. This final point leads us to one of the ways to resolve passive voice: swap a passive verb for an active one, either an intransitive or transitive pair. Passive and active verb pairs abound, their meanings related close enough for them to pass as rhetorical synonyms. This type of swap allows the passive subject to remain in its position of focus, but in a way that draws less attention. Passive voice is not grammatically wrong, but it is rhetorically weak, and weakness invites questions. Reducing its use can strengthen prose significantly. The character that repeatedly refers to a conflict in their past but never names the actual event. The recurring flashback that points to a dire outcome but never quite gets there. The narrator that conspicuously omits certain details from their narration. The danger of these examples lies in their likelihood to annoy a savvy audience. Avoiding a subject brings more attention to it. Treating it with ambiguity, however, leaves it open for the reader to interpret, and in many instances to assume that the narrator has addressed and resolved it. I have blogged about red herrings before, in a far more entertaining post than this one. Long story short, they can be a huge asset or a huge stumbling block. A while back my mom was in a book club that insisted on reading through an entire series of cozy murder mysteries. She said she always knew who the killer was because early on, the author would introduce a character who then faded away for the middle of the plot. The amateur sleuth would pursue instead a blatant red herring, and when that lead petered out, SURPRISE! The killer was that seemingly innocuous wallflower from the start. Only, when it happens every single time over the course of a whole series, it’s not much of a surprise. There is an art to red herrings. Namely, they must be believable. If they’re too over-the-top—trying too hard to draw attention to themselves, as it were—they lose their plot value. Amateur sleuths flock to red herrings like seagulls to a trash barge. The trick is not for the sleuth to assume another character’s guilt, but for the reader to assume it. And that requires crafty plotting indeed. 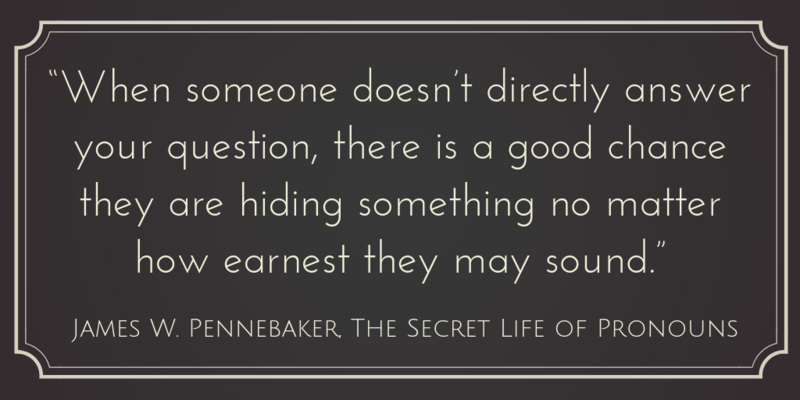 Narrators are guilty of indirect discourse when they avoid addressing questions that the reader has, or put off admitting things the reader has already figured out. Basically, if you talk around an issue too long, you point fingers at your own deception. We begin our basic patterns of deception with an easy fix: lack of contractions. Authentic human speech patterns include slurring words together. We have always had contractions in the English language. It’s how we got words like “never” (OE not + ever), “none” (OE not + one), and “neither” (OE not + whether). Contractions contributed to the loss of inflectional endings, and they led to our genitive case getting marked with -’s instead of its full syllable -es from a thousand years ago. A lack of contractions, then, points to inauthenticity. Liars often deny without using them, “I did not,” rather than “I didn’t.” The liar instinctively emphasizes their innocence with that non-contracted “not.” The truly innocent person, in contrast, has more interest in quickly refuting a false allegation rather than trying to convince their listener of their sincerity. Thanks to hundreds of years of grammar classes, we associate non-contracted speech with higher formality. If a speaker takes the time to enunciate all their words instead of contracting them together, they must mean Serious Business. Or, they’re trying to assert authority so that people won’t question them. Which, generally, hoists a red flag that something is amiss. The “No contractions” rule applies to high school essays, enforced by teachers who want their students to treat assignments like the Serious Business they are. It doesn’t apply to fiction or creative nonfiction. Use of contractions brings more authentic speech patterns to dialogue and narration alike. It should be the rule of thumb rather than the exception. What exceptions, then, exist? I can think of two off the top of my head. Liars. If you have a character telling lies, giving them a non-contracted denial is a nice, subtle cue. Foreign language learners. Speakers of English as a foreign language are less likely to contract words early on in their language learning. Similarly, if you have a character learning a second language, but where that language is still represented through English (a fantasy language, for example, where you’re not about to pull a Tolkien and your readers wouldn’t understand it even if you did), use of more formal language patterns can give an impression of careful speaking. I’m not the language police. Ultimately, each writer decides how best to implement contractions in their work. But if you abstain, don’t be surprised when I assign crazy accents to your characters to balance out their stilted speech patterns. Triple contractions are seeing more use, but proceed with caution in this vein. Words like shouldn’t’ve, couldn’t’ve, wouldn’t’ve, I’d’ve, we’d’ve, they’d’ve, etc. have more traction in their written forms than the less common I’ll’ve, we’ll’ve, she’ll’ve, won’t’ve, etc., but any and all of these can trip up a reader if used too liberally. We’ve not yet gotten to the point of quadruple contractions, that I know of, but I’d’n’t’ve approved if we had. Lack of contractions ≠ “archaic.” Shakespeare used ’em a’plenty. Archaic contractions are different than modern ones, however, because their clitics (the left-over word fragments that attach to their stronger friends) formed from the front end rather than the back. For example, archaic contractions of “it is” and “it was” give us the now-archaic ’tis and ’twas, as opposed to the modern contraction it’s. Long story short, if you need someone’s blessing to feel comfortable using contractions in your work, consider it bestowed. This is an easy fix for better authenticity.